I’ve been on a DevOps journey for a while now. If you’re in a similar place – am I just a dullard, or is it slow going?! I work mainly at the Ops side of the equation, in an environment that strongly favours open source solutions. Most recently I’ve been focusing on automating asset management/inventory. For this, OCS Inventory NG fits the bill well. The interface isn’t that slick, and I couldn’t for the life of me get the Active Directory integration working [UPDATE: now working; read this post], but for collecting software and hardware inventory, it’s the bomb. This inventory automation was a prerequisite for Rundeck. Since you’re here, you probably already know, but just in case you don’t: Rundeck is a fantastic tool for wrapping policies around any task you can dream of. You can use it for centralised job scheduling, you can use it to allow your developers to reboot servers without giving them SSH access, and you have ACLs and a full audit trail for everything. For Rundeck to be any use, it needs a list of servers to control, which brings me back to OCS Inventory. OCS knows about my servers, so let’s just get Rundeck talking to OCS. Then Rundeck will have an always-up-to-date list of server endpoints, with no human input required. Marvellous. Ensure all servers are tagged on their way into OCS Inventory. I use the installation switch /TAG="SERVER" with the OCS agent. On the OCS Inventory server, create a read-only MySQL user for the script. I created the user “[email protected]” (so its purpose was clear) and gave it the minimum permissions – SELECT on the accountinfo and hardware OCS tables. 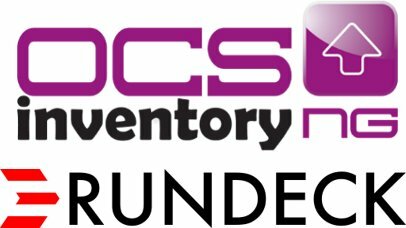 // OCS inventory integration into Rundeck. Referring to the database and the RESOURCE-XML Rundeck schema, you can extend this script to suit your needs. Add this to your Rundeck project configuration as an external resource model, with the URL of the above script. E.g. http://ocsserver.domain.com/ocsreports/rundeck-xml.php. All being well, every server from OCS Inventory will now appear as a node in Rundeck. Previous PostPrevious GDPR: what is a small UK business to do?